Explanation: Bright young stars sometimes sculpt picturesque dust mountains soon after being born. Created quite by accident, the energetic light and winds from these massive newborn stars burn away accumulations of dark dust and cool gas in a slow but persistent manner. Such is the case in NGC 3324, a star forming region near the edge of NGC 3372, the energetic and expansive Carina Nebula. Pictured above, in scientifically assigned colors, is only a small part of NGC 3324. The Carina Nebula itself is one of the largest star forming regions known and home to Eta Carinae, one of the most unstable and variable stars known. The above image was created from archived Hubble Space Telescope data in honor of the 10th anniversary of the Hubble Heritage Project. 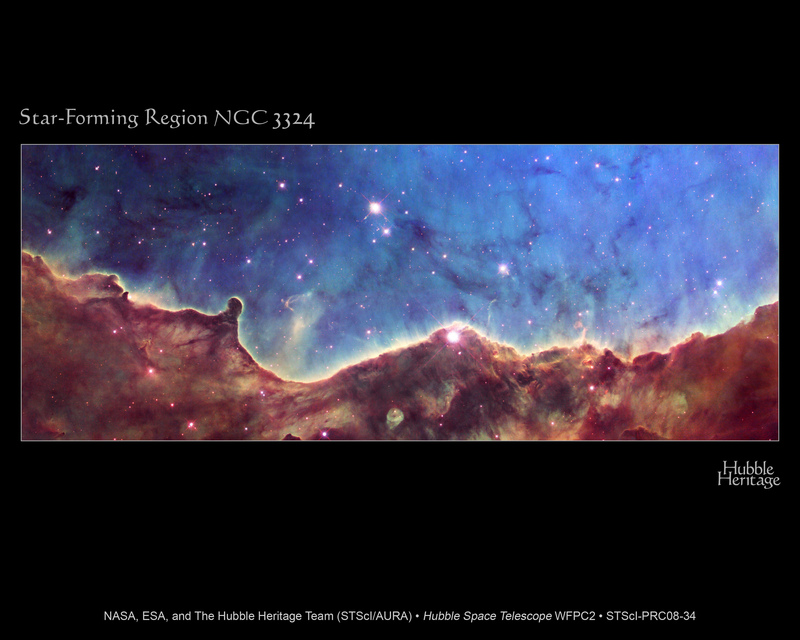 The Hubble Heritage Project has created, so far, nearly 130 visually stunning images.